NFL: Who Has Been the Best No. 1 Overall Pick in the Last 10 Years? Being the No. 1 overall pick in the NFL Draft carries a level of expectations that some players are simply unable to meet. Part of it is because of the financial burden that comes with being the first player selected in the draft, and the other part of it is the notion that the player who is selected in this slot will be expected to be one of the pillars of the franchise for several years to come. The No. 1 overall pick in the 2015 NFL Draft, quarterback Jameis Winston (pictured above) out of Florida State, has yet to play a down of football in the NFL, but the Tampa Bay Buccaneers are already counting on him to be the face of their franchise for at least the next decade. By all accounts, Winston has committed himself to being a professional and is ready to put his off-field issues from college behind him. If he does, he will likely play his way onto this list. But for now, we chose to leave Winston off of our list – at least until he has one year in the league under his belt. Our list is a ranking (from worst to best) of the last 10 No. 1 overall draft picks (2005-2014). The list includes a player who may be the biggest bust in NFL history, and two players who are likely bound for the Pro Football Hall of Fame in Canton, Ohio. In the middle there are several players who still have plenty of time to strengthen their NFL resumes. Without further ado, here is a look at best No. 1 overall draft picks of the last 10 years. There really isn’t much more that’s left to say here. Russell (pictured above) was arguably the biggest draft pick bust and the worst No. 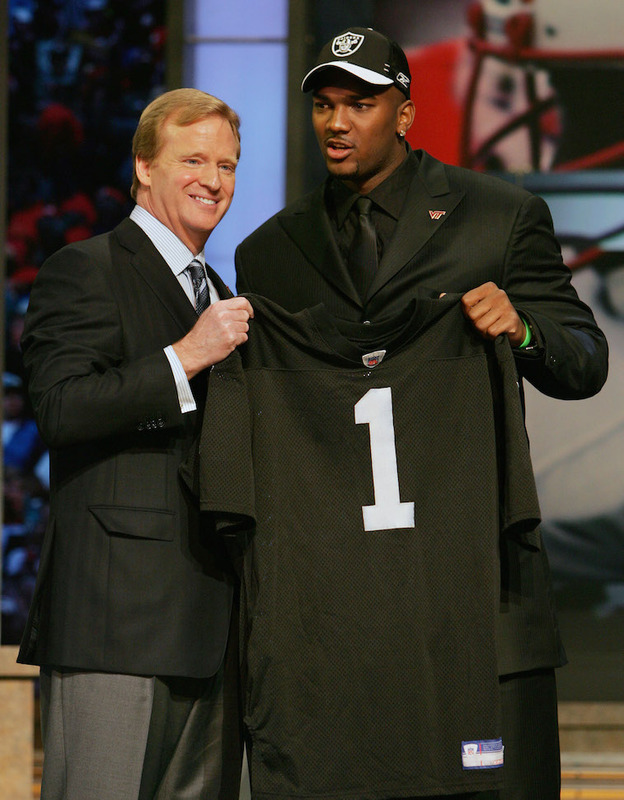 1 overall pick in NFL history. 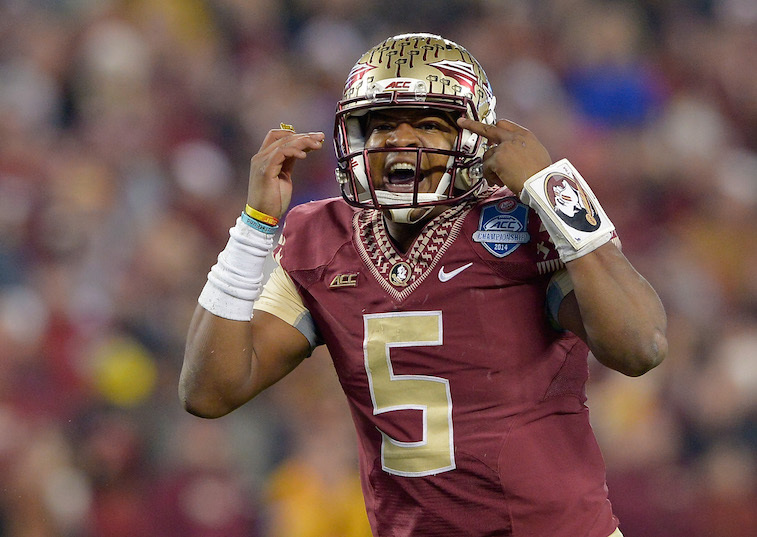 Timing can be everything when it comes to the NFL Draft. Sometimes teams are just flat out unlucky and land the No. 1 overall pick in a weak draft, which is exactly what happened to the Chiefs in 2013. The Chiefs were in desperate need of a franchise quarterback and there simply weren’t any available that year. They settled on Fisher, and the Central Michigan product has been a disappointment up to this point in his career. In 2013, Pro Football Focus (PFF) ranked Fisher as the 70th-best offensive tackle in the league, and in 2014, PFF ranked him as the 72nd-best offensive tackle in the league. Those rankings have Fisher on the verge of achieving “bust” status. 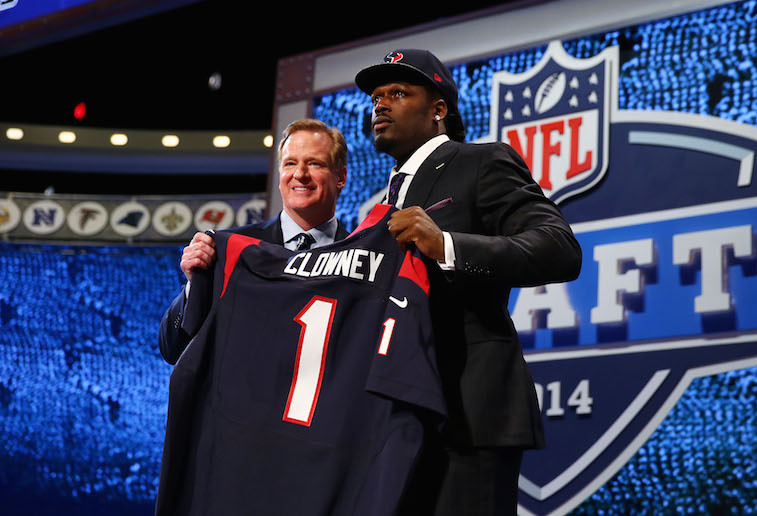 The jury is still out on Clowney (pictured above), who only played in four games, making two starts, as a rookie in 2014. The former South Carolina defensive end is one of the most physically gifted players to ever enter the NFL, and if he can come back at full strength in 2015, he has the ability to quickly work his way up this list. Bradford’s career with the Rams was marred by an unfortunate string of serious injuries. When he was able to play, however, he showed signs of having the ability to have a long, successful NFL career. Bradford is getting a fresh start with the Philadelphia Eagles in 2015, which means that there is still time for the former Oklahoma Sooner to realize his NFL potential. 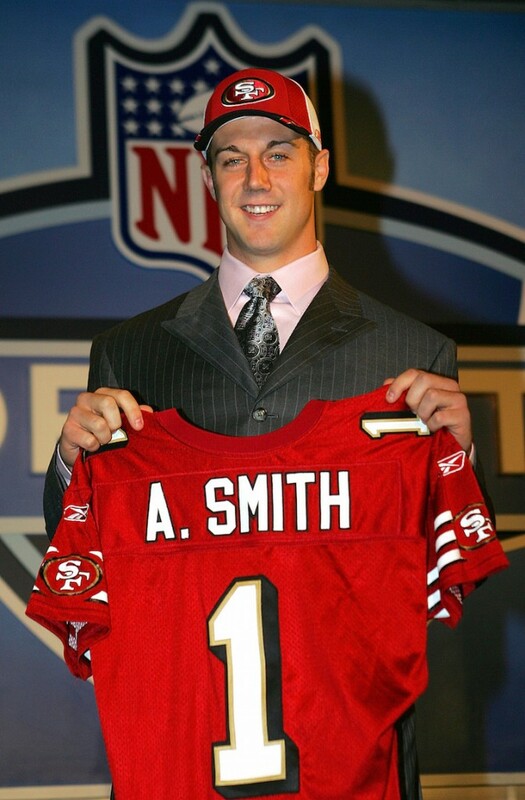 The 49ers will forever be kicking themselves for passing on a quarterback named Aaron Rodgers in favor of Smith (pictured above) back in 2005. As a northern California native and college star at the University of California, Rodgers seemed like the logical choice. All Rodgers has done is go on to win a Super Bowl and two NFL MVP awards for the Green Bay Packers. Smith, meanwhile, hasn’t been awful, but has proven to be more of a game-manager than a game-changer at quarterback during his nine-year NFL career. He now plays for the Kansas City Chiefs, and never really lived up to the expectations of a No. 1 overall draft pick. Newton burst onto the NFL scene as a rookie in 2011, struggled in his second NFL season in 2012. He matured and has since put together back-to-back solid seasons in 2013 and 2014, leading the Panthers to the NFC Playoffs both years. He recently signed a massive contract extension with the Panthers, and is on track to be the face of their franchise for the foreseeable future. The next step for Newton will be to lead Carolina on a deep postseason run. Up to this point, Newton has proven to be worthy of his status as a No. 1 overall draft pick. Long (pictured above) saw his career get off to an amazing start before it was derailed by a series of injuries. 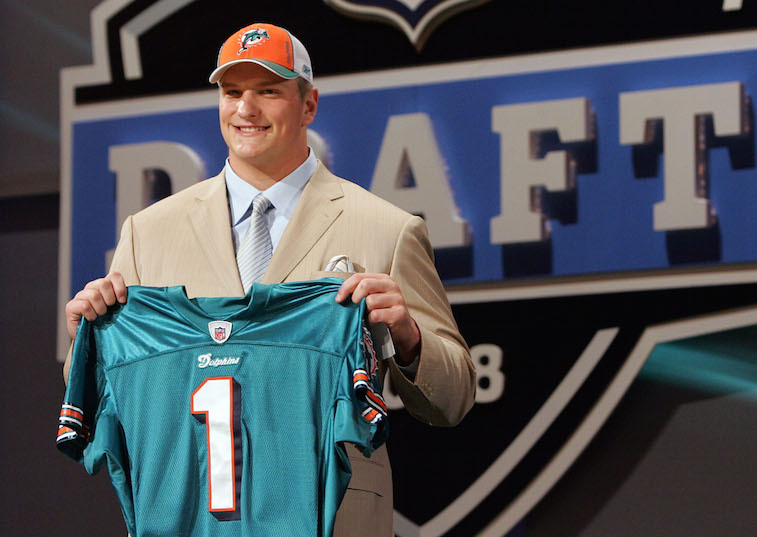 The former Michigan Wolverine was selected to the Pro Bowl in each of his first four seasons, and was named to the NFL All-Pro team in 2009 and 2010. It appeared as though Long was well on his way to playing himself into the Pro Football Hall of Fame before his injuries slowed him down. He is currently a free agent and is contemplating a comeback if the right situation pops up. Over the last four seasons, Stafford has developed into one of the better quarterbacks in the NFL. Granted, he has benefited from having Calvin Johnson as his No. 1 target, but there is no denying that the former University of Georgia signal caller is now on the verge of earning elite quarterback status. He has led the Lions to two postseason appearances, but is still in search of his first playoff win. We have a feeling that could come as early as 2015. It seemed like a forgone conclusion that former USC running back Reggie Bush would be joining whichever team landed the No. 1 overall pick in the 2006 NFL Draft. The Texans went against conventional wisdom and used the pick to take 6-foot-6 defensive end Mario Williams out of North Carolina State University. What seemed like a foolish move to many at the time, proved to be a genius move by Houston. Williams quickly developed into one of the premier defensive lineman in the NFL, and with 91.0 career sacks, the 30-year-old is well on his way to earn a bronze bust in the Pro Football Hall of Fame. 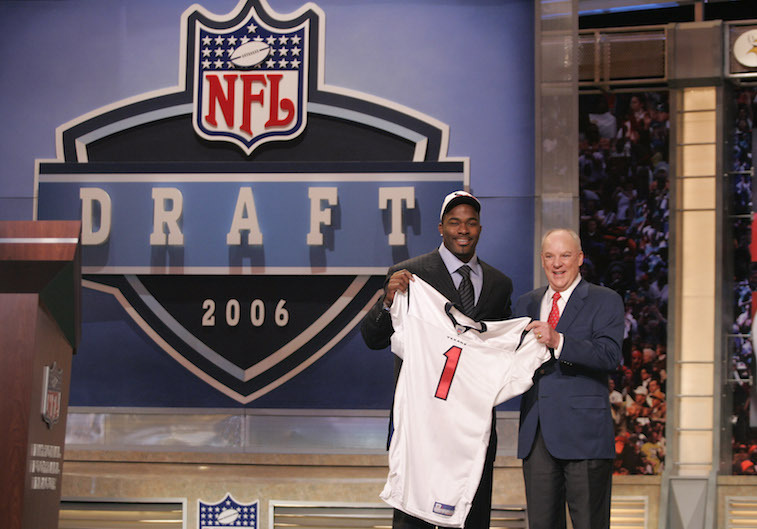 The Texans’ opting to Select Williams over Bush, and quarterbacks Vince Young and Matt Leinart, was one of the greatest decisions in NFL Draft history. It’s hard to imagine a franchise having the luck that the Colts have had. In 1998, they earned the right to select Peyton Manning with the No. 1 overall pick in draft. Fast-forward 14 years, and the Colts landed the No. 1 overall pick in a draft that was set to yield the best quarterback prospect to enter the NFL since John Elway in 1983. That quarterback was Andrew Luck. The Colts felt so strongly about their future with Luck at the helm that they released the great Peyton Manning to make room for the former Stanford Cardinal to step right in as the team’s starter. 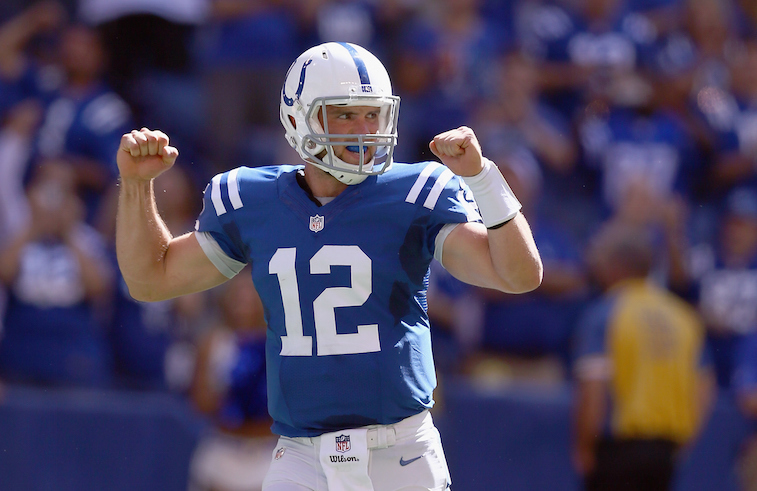 Luck has only played three seasons in the league, but he has already joined the exclusive club of elite NFL quarterbacks that features guys like Aaron Rodgers, Tom Brady, Peyton Manning, and Drew Brees. The sky is the limit for the 25-year-old signal caller, and we have a strong feeling that he will go down as one of the all-time NFL greats.